When you think Rick Stein, you automatically think seafood. He really is the godfather of seafood in my eyes. Ever since I developed my passion for all things food, Rick Stein has been a big part of this love affair. A kind of foodie crush, but not in a kissy kissy kind of way. More like a relationship of respect for his ability to cook something just plucked from the ocean and transform it into something delicious with a few simple ingredients. Usually excellent local fishmonger didn’t have the delicious snapper with skin-on that I was looking for. Very average alternative fish selected. My mistake! I should have known right from the start that Mr Picky Palette would protest eating a meal that included both sweet (mango) and savoury (avocado). In principle, in my opinion, this would be a fabulous pairing, especially with the inclusion of chilli (we are big fans!). However, my mistake was selecting a rather average mango. Had it been one of those luscious, juicy, ripe ones that they use in those large supermarket chain ads proclaiming “we’re the freshest supermarket in the whole world” then it would have transformed the dish into that beautiful combination of sweet and savoury that actually works. Needless to say, Mr Picky Palette’s feedback on this recipe is not printable! It went along the lines of “don’t ever make that again”. The salsa recipe calls for cooked green prawns. Huh? Don’t ya just mean cooked prawns? Anyway, I bought green prawns and cooked them in a good knob of butter and a pinch of salt and they were a delicious addition to the salsa. You could easily just buy your prawns cooked and slice them thickly. In summary, this is a simple, quick and healthy recipe which I will definately attempt again with a few minor adjustments and more chilli! If you are using a barbecue, light it 30-40 minutes before you want to cook the fish. For the salsa, cut the chillies in half lengthways and scrape out the seeds with teh tip of a small knife but leave the ribs behind to give the salsa a little more heat. Cut them crossways into thin slices. Then simply mix all the ingredients together. If you are not cooking the fish on a barbeque, put chargill over a high heat or preheat the grill to high. Brush the snapper fillets on both sides with olive oil and season well with salt and pepper. Cut each into 3, slightly on the diagonal. 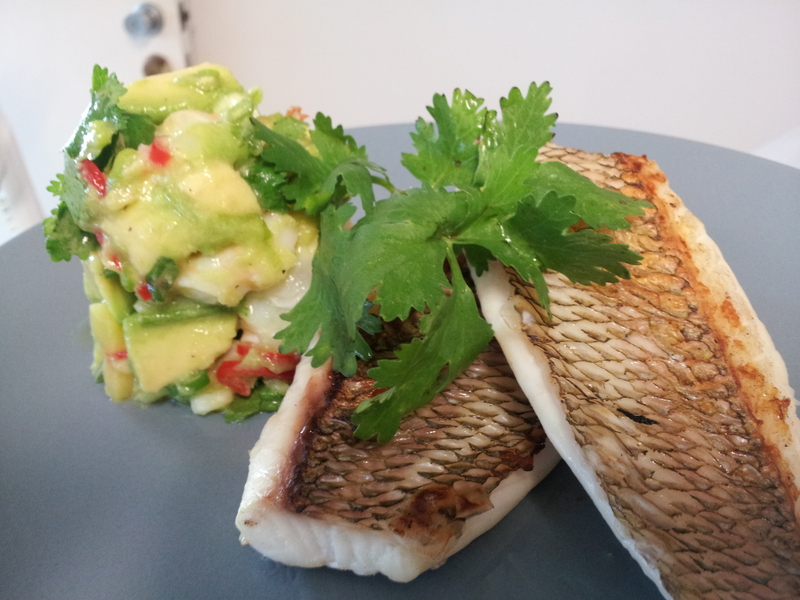 Cook snapper either skin-side down on barbeque, or skin-side up under grill, for 3-4 minutes. T0 serve, spoon salsa on to 4 plates and arrange the strips of fish on top. Drizzle a little oil around the edge of the plate and garnish with coriander.